We got a call from the assistant curator of public programs at the Williams College Museum of Art (wcma.williams.edu) to ask if we'd be interested in participating in their summer series, Osmotheque. Taking inspiration from the museum's impressive collection, we were to create olfactory compositions informed by works of our choosing and then present them at the museum. It was an easy "yes" to accept the offer - and quite an honor. Robert and I visited the impressive museum for the first time shortly after to select the art works that would be the muse our creations. We purposefully chose four that represented different points of view, techniques and mediums to challenge ourselves to formulate distinct scent profiles. The artists and their works we selected were: George Inness', "Spirit of the Night", Robert Rauschenberg's, "Booster", Meleko Mokgosi's, "Lerato", and Edward Hopper's, "Morning in a City" (the eponymous scented candle now available at the museum and at source adage). On August 10th we presented the art-inspired fragrances in an auditorium setting with a brief introduction to the history of fragrances, the artists and their works, and our process in developing these particular scents. We then invited the audience to explore the galleries where they would find our creations, with each single fragrance component, beside the artworks. It proved to be a powerful method to illustrate how individual notes are layered to create a final composition - much like mediums in fine art. 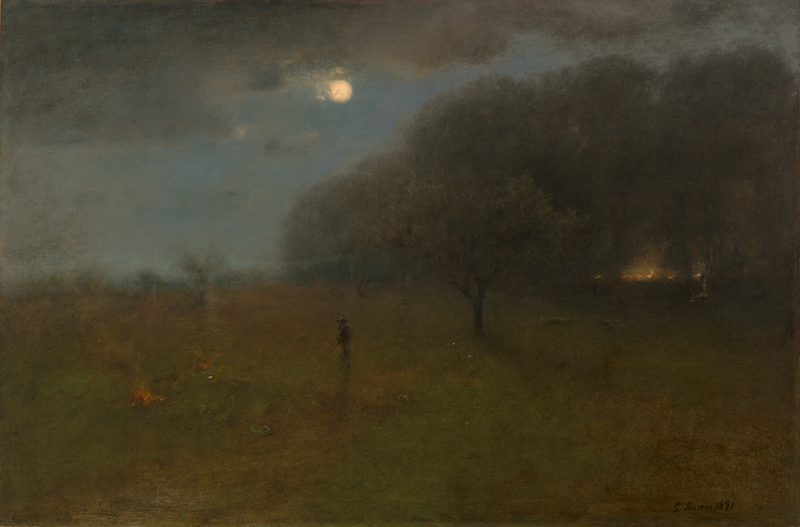 The Inness landscape was the most literal interpretation as a fragrance. The painting itself is very atmospheric which immediately evokes the smells of smoke, earth, wood, grass and a balmy, thick air. Woodland notes of fallen leaves, fertile earth, aromatic wood and smoke would be the pillars of this scent. Rauschenberg's conceptual visuals and use of mixed mediums proved to be more challenging compared to the Inness, Hopper or even Mokgosi. Still we were intrigued and let the materials inform the scent we were to compose. Ink, paper, film (X-rays), carbon all inspired a "chemical slant" to our fragrance. Here, we experimented with synthetics which seemed appropriate in capturing a detached, almost antiseptic feeling that we found in Rauschenberg's works. In Mokgosi's work, although depicting the daily life and/or allegories of a culture that was foreign to us - literally, the shear emotional response from his "Lerato" (Love) diptych would lead us to use lush, woodsy and resin notes with just a bit of floral sweetness that spoke to the work's theme. Hopper's painting, "Morning in a City", was more of a psychoanalytic exercise. His technique and composition renders the environments eerily still as if the oxygen was sucked out of the room. Yet, with the still figure, lost in thought, you can't help but try to assess her state of mind, what she is about to do, or has just completed. The cool, damp feeling of the room vs. the warmth of the outside world, the pale skin vs. the fiery hair. It's both serene and dynamic simultaneously. Our fragrance aimed to capture a sweet seductiveness contrasted by a slight bitter sharpness with the notes we blended. This one you can judge for yourself if we achieved our goal . . .